Athos Bousvaros, MD, and Susan Kornetsky, MPH, both of Boston Children’s Hospital, recently created a comic book, titled Sophie’s Science Project, to help teach children about medical research. Below Dr. Athos shares their motivation for creating the comic book and what they hope it will accomplish. For children and adolescents to participate in pediatric clinical research, parental permission is needed, but the children themselves are also expected to provide assent. Assent is defined by the US Department of Health and Human Services as “a child’s affirmative agreement to participate in research.” For many clinical studies, assent is documented by either having a child co-sign a five to fifteen page document filled with legalese (that in many cases even the parents barely understand), or sign a separate assent form. Usually, children participating in research projects agree with what their parents recommend, without having any clear knowledge of what research is or why research is being done. Investigators are actively working to address this gap in subject education by developing various initiatives, including efforts to simplify the consent/assent process and to determine what is really required in consent documents. We took a “low tech” approach to educate children about research and the informed consent process, utilizing a medium that American writers and artists pioneered in the first half of the 20th century: comic books. 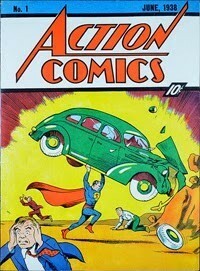 Comics have been a mainstay of American popular culture since Superman first appeared in Action Comics #1 (June, 1938). In the 1940s, printed comics were selling millions of copies per issue, but the development of newer media (movies, television, and the internet) resulted in gradual declines in circulation.